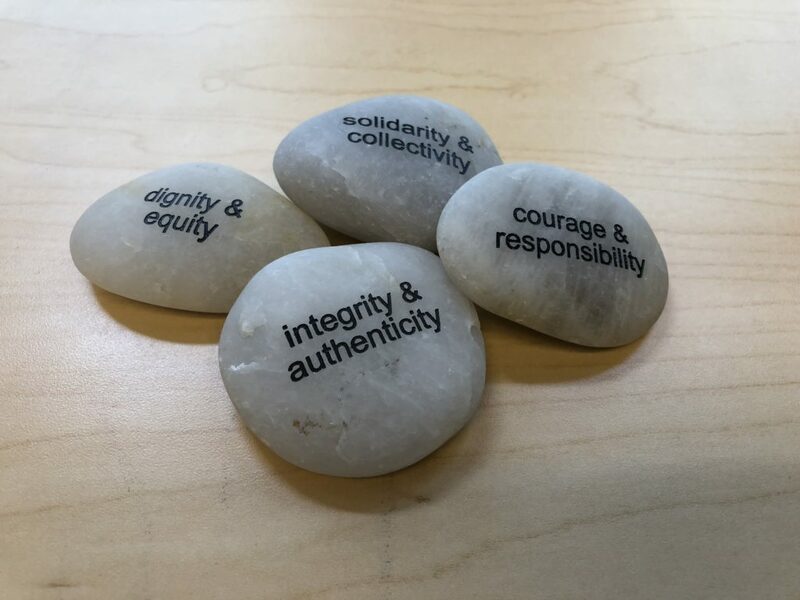 The values and principles that undergird this framework include those articulated in The Choir Book: A Framework for Social Justice Philanthropy by Justice Funders. The following value pairs serve as comprehensive guides for grantmakers in conducting philanthropic practices that support and align with social justice movements. We believe that all people deserve equal rights and access, the dignity of self-determination and the agency to shape the decisions that impact their lives. We seek to be effective and humble partners, allies and champions with and for communities, with an ecosystem view and a collaborative approach. We strive to live and act consistently in accordance with our values, and work to be conscious of both personal growth edges and systemic constraints in a genuine, truthful and transparent manner. We take personal responsibility to leverage our access, skills and power to benefit others, and take risks to try unproven approaches and to speak truth to power. The Resonance Framework is also grounded in and committed to the Just Transition principles. While there are many iterations of the principles of Just Transition, we are guided by the ones curated by the Climate Justice Alliance (CJA), from their members and allies. Below we share CJA’s Just Transition Principles, with added comments and emphasis for how each principle relates to philanthropic practice. In philanthropy, this principle guides us to shift from thinking about the many actions we could take (an inherently privileged perspective) to thinking about what is necessary for all to thrive. As part of this process, we acknowledge how communities and movements have been working towards Buen Vivir for hundreds of years and that not all cultures prioritize financial return over community and collective benefit. In philanthropic practice, this principle guides us to fund in a way that recognizes and values the expertise and leadership of communities, rather than undermines their potential through restricted grants and extensive monitoring. Related to the previous principle, upholding self-determination in philanthropic practice means ending the paternalistic and controlling behaviors towards grantees that are based in risk-aversion, and moving towards authentic partnership where grantees retain the right to design the solutions for their lives rather than have approaches imposed on them. Many might say that, by definition, philanthropy is about redistributing resources. Yet to truly embody this principle, philanthropy must move far beyond the 5% payout requirements for grants and distribute ALL of its power and resources. This includes spending down one’s endowment, investing in local and regional economic initiatives that build community wealth rather than investing in Wall Street, giving up decision-making power for grants, and, ultimately, turning over assets to community control. This principle requires philanthropic institutions to recognize their role in reorganizing our economy in a way that is rooted in regenerative ecology. Everything from grantmaking to investment strategies, to organizational and operational practices, can be done in ways that honor the sacredness of our natural resources and supports a vibrant and resilient life for all people and the planet. Living this principle in philanthropy requires recognizing that dominant philanthropic practices represent one world view and culture, and it is infused with the values of capitalism, patriarchy and white supremacy. We must then work to break philanthropic practice out of those “source codes” and to make it more adaptable, accessible and just. This principle guides philanthropic institutions to break out of geographic and issue silos and to instead take an ecosystem approach. An ecosystem approach encourages funding to multiple organizations that have interdependent relationships to one another and are employing diverse, complementary strategies in ways that build social movement infrastructure and advance a shared vision over a sustained period of time. Ecosystems are defined by movement leaders who are accountable to an organized base (i.e. residents or community members).